Apple’s new Maps app that came with iOS 6 is full of problems. For some it works great, but for some it’s a disaster. Apple’s CEO Tim Cook recently wrote an open letter to customers apologizing for all the frustration and inconvenience it has caused. It was even suggested that customers use alternatives such as Google or Nokia Maps through Safari for now. As bad as the new Maps app is, it works fairly well in the United States and other major cities around the world. In The Amazing Maps Race conducted by Reuters, the Apple Maps did work good. 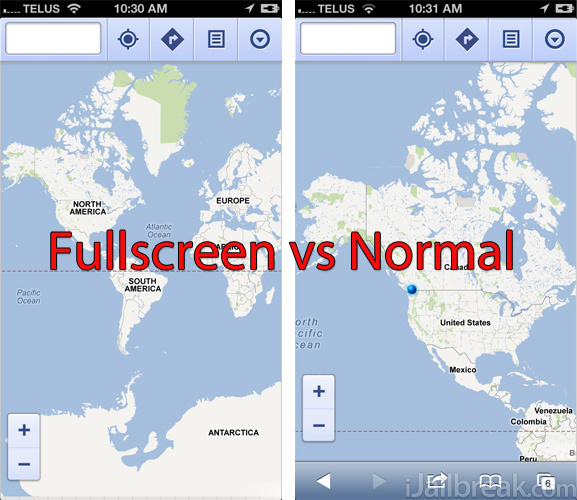 However, if you want to use alternatives such as Google or Nokia Maps on the web, then it would make sense for you to use them in a fullscreen mode so that it feels more like an actual app. As such, here’s how to run either Google or Nokia Maps in full-screen on iOS 6 from the homescreen. It’s quite simple and only requires you to install certain configuration profiles. Step 1) – Go here and install the web profile. Step 2) – Enter your passcode if it asks for a password. That’s it. You can now run the Google Maps web app in full-screen without any distractions. Another alternative is the Nokia Maps web app, which also works better than the iOS 6 Maps. To get the Nokia Maps running in full-screen go here and install the web profile. Remember, both the Google and Nokia Maps are only web apps, and they still run in Safari. It’s just that you get the actual icons and the feel of an app. In no way are they as good as the real thing. Unfortunately there is no official Google Maps or Nokia Maps app for iOS. Nevertheless, these alternatives still work better than Apple Maps. Thanks to Ben Guild and Neil Ross Goco, who created the web profiles with the original icons.